I'm told that Fridays are Fair Isle Fridays. I'm good with that. I've knit quite a bit of fair isle (stranded knitting) over the years and I've been in a fair isle knitting phase since returning from Shetland last September. In Shetland I visited Jamieson & Smith's, Jamieson's (not related to J&S), toured the mill, met designers, took classes, checked out patterns, met some knitters and visited a couple of museums. I don't know if I'd say that it's changed my knitting life exactly. Instead I would say that it has profoundly intensified my appreciation of the Shetland fiber culture, and Shetland itself. I have two projects on my needles at the moment, using wool from Shetland. One is the Mini-Mitten Advent Calendar Garland.. This was a knitalong which ended in December but I started late. My goal is to finish by the beginning of December 2016. I've completed 11 of the 24 little mittens and the project is very addictive. I'll finish up one mini-mitten and immediately want to cast on for the next one. I don't foresee any problem finishing in time this year. 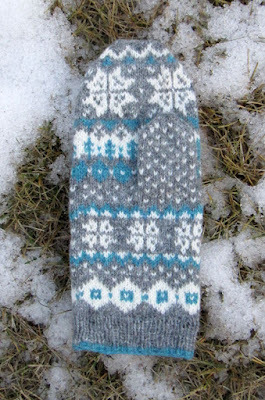 The other project is also a knitalong, created by the same designer who made the mini-mittens. This time the mittens, called Winter Snows, are adult-sized. I've also been calling them my Snowflake Mittens. I have the right mitten completely finished and blocked and I love it. I made a few alterations to the pattern as I wanted a more close-fitting, snug mitten. I started the decreasing on the thumb and at the top of the hand sooner than called for in the pattern. I cast on in the blue to add a bit more color to the cuff. Now, like socks, I have to make the left one - no second-mitten syndrome for me. I made good notes on the modifications so it shouldn't take long to finish up the other mitten. With the weather we've had in Calgary lately, I might not need them this year, but if I do, I'll be ready. I can see myself using this shape and the directions as a template for more mittens in the future since the fit is just what I want it to be. It could be a good stash-buster...something to use some of the small bits of yarn leftover from multi-colored sweaters. I am so drawn to Shetland that I've made the decision to go back again this year. Last time I was with a tour group and we were there during the week before Wool Week, which really was fabulous. This time there will be just four (maybe five!) of us and we will be in Shetland for Wool Week itself. I'm excited and looking forward to taking some classes with fair isle experts, seeing more of the island, exploring. I have already planned to bring back enough yarn to make a fair isle cardigan. I'm thinking about using red as the main color. That's all the wool that I plan to bring back. Really!